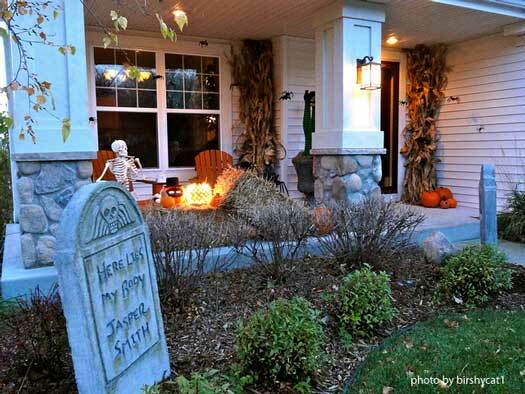 This Halloween, turn your home into the most “spooktastic” house on the block. 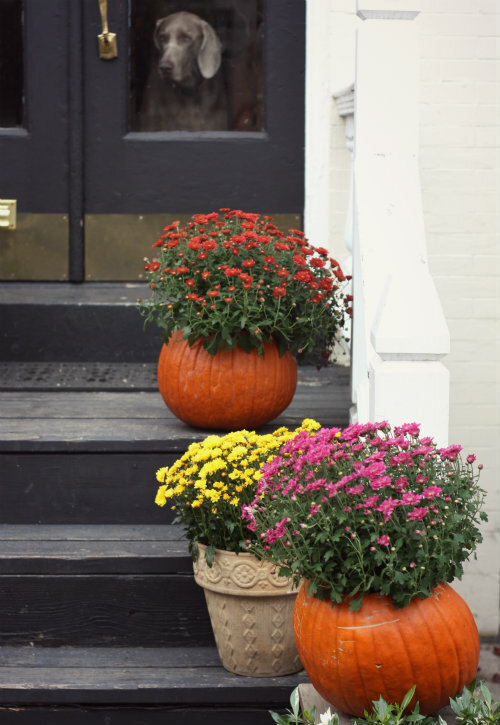 With these creative decorating tips, make your stoop the talk of the trick-or-treaters. From pumpkin art masterpieces, to cobwebs, to ghosts and more, get the entire family involved in a holiday decorating session or even a decorating contest! Get started creating your home’s very own “Halloweentown” with your family’s personal touch included! Share your creations and ideas with us! 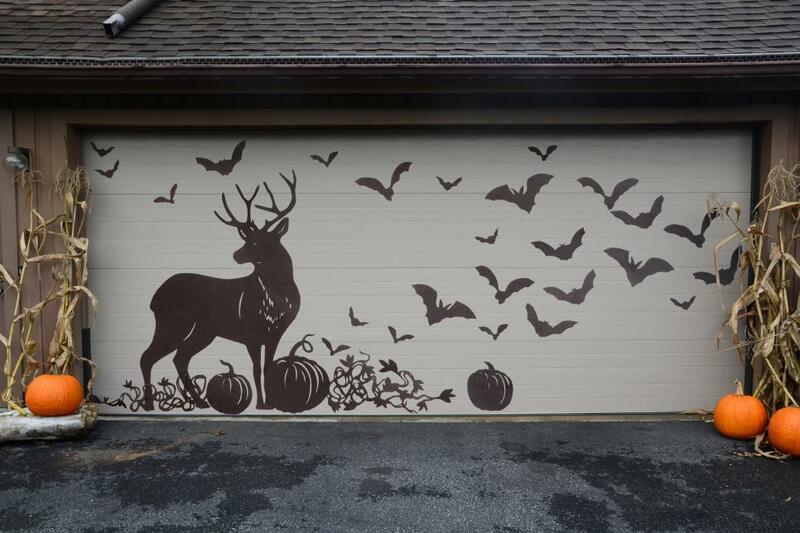 Create a shadowy scene on your garage door with the help of adhesive black vinyl sheets. Use the vinyl sheets and scissors to fit your creation to the size of your door. If your garage door rolls up and down, don’t forget to cut the vinyl pieces at the seam of each panel. When Halloween has passed, it takes no time at all for your garage to return to normal! For more instructions on how to recreate this look, click here! Don’t worry- he’s not real! If you are not planning on staying home on Halloween night to visit with trick-or-treaters, have this headless horseman hold your candy FOR you. After creating a sturdy base, add the legs, the arms and the torso. Feel free to add your own creative touch with the clothing. 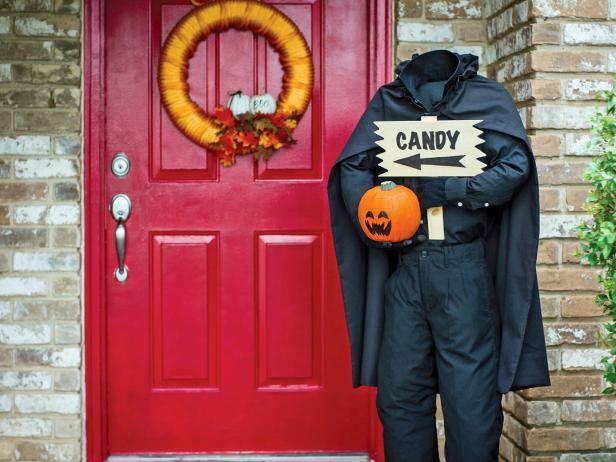 Your final touches can include hands and a candy sign! For more instructions, click here! Not all Halloween decorations have to give your visitors a fright! Before cutting into those ripe, fall pumpkins into jack-o’-lanterns, put them to use as pumpkin flower planters. After cutting a wide circle at the top of your pumpkin and packing in the dirt, find an array of your favorite fall colored flowers to fill your planters with. Don’t forget to drill holes in the bottom of your planter to allow for proper water drainage. Learn more about this DIY project here! “I was Carolina born and Carolina bred, and here I lay Carolina dead.” Give your DIY yard tombstones a personal touch with original messages from the dead. 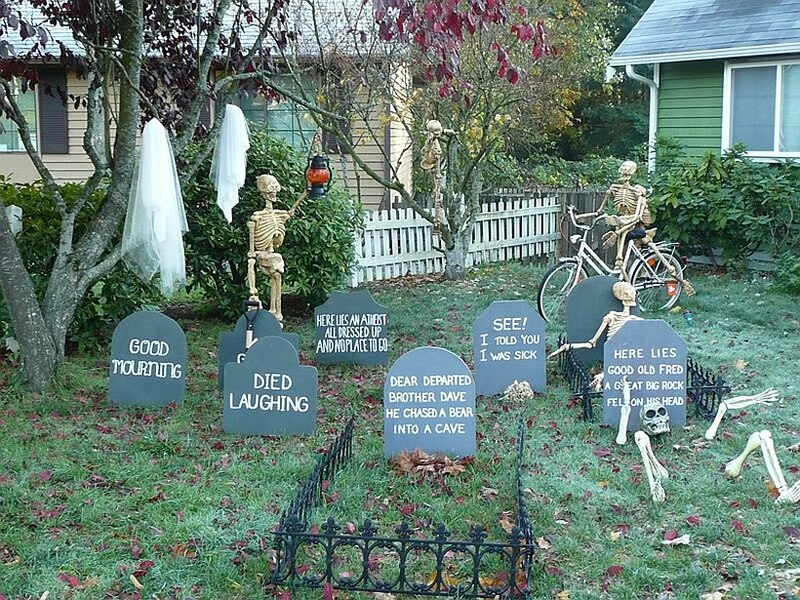 Invite your trick-or-treater guests to walk through a cemetery filled with both humorous and creepy tombstones of your choosing. Use Styrofoam, carbon paper and permanent markers to form your deadly masterpieces. With little cost and little time, your cemetery will be up and running before the night is over! For more directions on this project, click here! Put those toilet paper and paper towel rolls to good use for this DIY Halloween décor project. 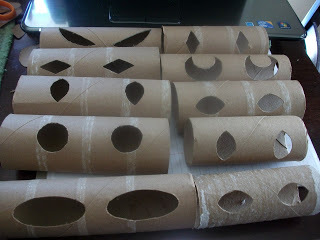 Trace a pair of eyes onto the roll and cut out the two holes, or maybe even three! Find colored cellophane bags to change the colors of the eyes. After sliding strings of Christmas lights through the rolls and placing them throughout your bushes, all eyes will be on you!